Have you ever felt like a fraud or failure as you struggle to find balance in life? Do you find yourself juggling everything in mediocrity and feeling like you're succeeding at very little? In her no-nonsense style, Alli Worthington - popular podcaster and author of The Year of Living Happy - tackles the big questions about finding happiness and one's God-given purpose. Have you ever felt like a fraud or failure as you struggle to find balance in life? Do you find yourself juggling everything in mediocrity and feeling like you're succeeding at very little? 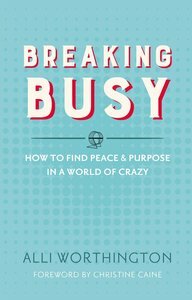 In her no-nonsense way, Alli Worthington tackles the big questions about finding happiness and one's God-given purpose.